Some days ago, the divine Ruby Campbell (www.LoveArtGallery.net) wrote we artists saying that people are Christmas shopping in the gallery! She invited us to bring more art to celebrate the upcoming times. I was shocked to realize it is autumn (not summer), and the next day as I as assisting installation in TRAG Gallery in Oregon City I was decorating a holiday tree! It’s great to get the good surprise when someone brings a seasonal reference to my attention! I was so excited to create in the vein of Solstice and light and tradition. I set aside my Sacred Hoop endeavor for a bit, and went for these six little 6×6’s. 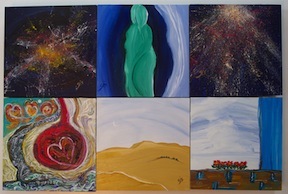 Their titles are (top left to right, then bottom left to right): “Star Baby,” “Healed With Light,” “Cosmic Kiss,” “Decorate With Heart,” “Walk to Know,” and “Poinsettia.” I felt veils of many places I have been during my life for the “holidays,” and it was very sweet studio time. These pieces are painted on birch panels and are available at LoveArt! Gallery. I am also documenting them on my website www.CherilynSunRidge.com in the Terra, Figurative, and Symbology Portfolios.